Coated 14 Ga. mild steel support hook (fully adjustable, designed to be bent to fit a variety of weapons). 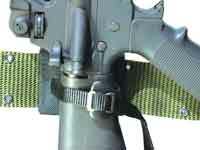 Safety Strap designed to hold the weapon into the support hook. providing rapid release and adjustability for most weapons. Designed to fit 2.25" web belt. Right or left Handed Models. 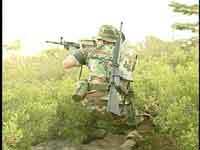 The KB-9 Guard Holster has been specifically made to fit the U.S. Military Web Gear. Originally designed for the BDL sharpshooter, it didn't take long for it to get into the hands of others looking for a solution to their carry. We've had a lot of request for this particular holster to fit everything from a Mossburg shotgun to an M4 carbine. This holster will secure the weapon to the waist, both muzzle up and/or muzzle down (it's fully adjustable). 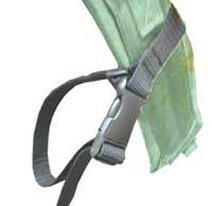 This holster is typically used in conjunction with a sling or strap, and has been successfully used with several sling styles, such as the three point sling and the standard two point slings. 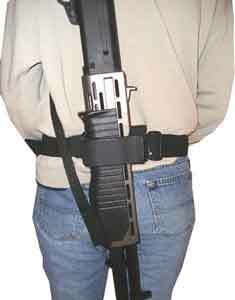 The KB-9 holster can be worn in various positions about the waist such as the rear, the side or toward the front, according to the user's needs. 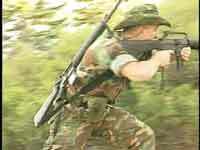 The holster has been successfully attached to armor type vests as well as molle' systems. 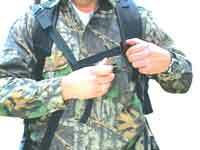 The optional Pack Attachment can also be added to achieve several additional carry methods. There are many benefits to the KB-9 holster, in harnessing the firearm at the rear of the body, -None more apparent than shown in these photo's. 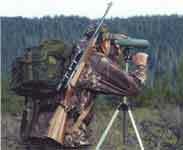 The weapon's location is kept clear from physical restrictions that may previously interfere with freedom of movement. The KB-9 holster will simply turn a two point sling into three points of stability by securing the lower stock to the waist. The coated 14 Ga. support hook has been designed to fit most rifles with little hook adjustment (bending). The support hook can be specifically manufactured to fit any particular weapon, fitting most any location on the gun, by request. 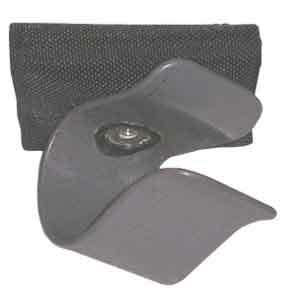 This holster (shown in photo) can be used as shown or adjusted (opened up) to receive the forestock of same. 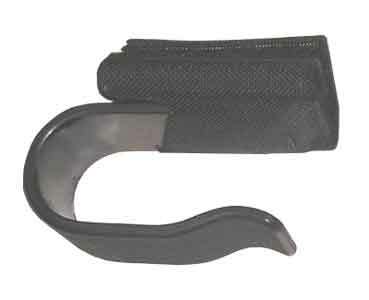 The steel hook is riveted to an internal bladder that, in turn is sewn into the belt securement, its very tough. 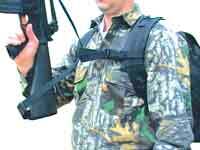 Attach the 'Universal backpack Attachment'(UPA) to almost any shoulder harness (pack or MOLLE system). UPA provides additional stability in the application of front or side carry method. 2. UBA mounted to opposing side as weapon to be carried. 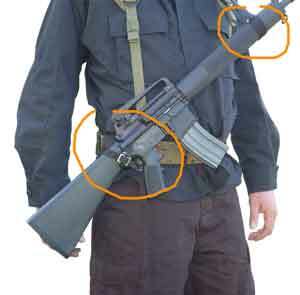 1.Rifle secured into holster mounted on belt, located at side. 2. 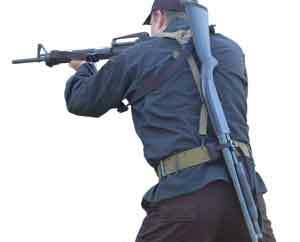 UPA attached to shoulder harness on opposing side (buckle outward). As shown above working in conjunction with a standard style two point sling. 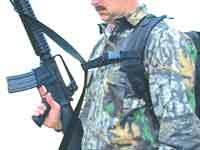 The swivel holster has been designed to support smaller weapons such as the MP5, G36 and certain applications involving the M4 carbine. 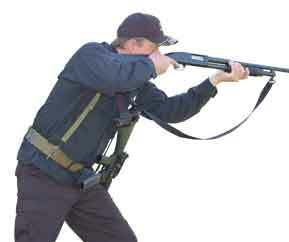 In most cases, the swivel holster is used in conjunction with a three point sling and can be located in various positions about a user's waist. The relationship of the support portion of the holster can be adjusted to perform at different angles to accommodate most positions required. 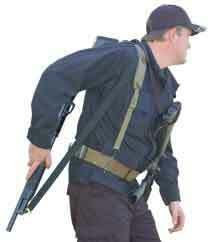 This holster is preferred by individuals who perform rapid entry and apprehension. 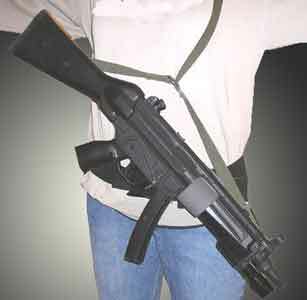 There is no 'safety strap' as the gun is held into place by tension of the support clip. An amount of force is necessary to introduce the weapon into the support as well as exit the apparatus.